Ron Hassey is a native Tucsonan. As a student-athlete at Mansfeld Jr. High, he played on the City Championship Baseball team that posted a 12-0 record. In 1972, Ron played on the State Championship Baseball team at Tucson High School with a 24-0 record. From there he attended the University of Arizona on a baseball scholarship. The 1976 UA baseball team was the first team in UA history to win a National Collegiate title. Ron holds the school record for single RBIs and also career RBIs. In addition to his collegiate play, he was selected to four different USA teams and was selected captain of the USA team for Pan Am Games in 1975. Ron began his professional major league career in 1976 with the Cleveland Indians. Other major league teams he played for were the Chicago Cubs, the New York Yankees, the Chicago White Sox, the Oakland A’s and the Montreal Expos. In 1988, 1989 and 1990, Ron played for the Oakland A’s who were in the World Series all of those years, winning the World Series Championship in 1989. He is also recognized as the only catcher in baseball history to catch two perfect games. In 1981, with the Cleveland Indians, he caught Lenny Barker and in 1991, ten years later, he was behind the plate for Dennis Martinez with the Montreal Expos. After 13 years in the major leagues, Ron retired as a player after the 1991 season. In 1992, he was hired as the New York Yankees’ Advance Scout. In 1993, he began a three-year coaching stint with the Colorado Rockies. The Rockies reached playoffs as the wild card team in 1995. 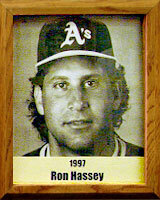 The next year, in 1996, Ron was on the coaching staff for the St. Louis Cardinals as Tony LaRussa’s Bench Coach. The Cardinals made the playoffs that year.